Doug Schantz doesn’t care much for sports, doesn’t cook, and has never tended bar. Yet he succeeded in achieving his dream of opening a gay sports bar in Washington, DC. 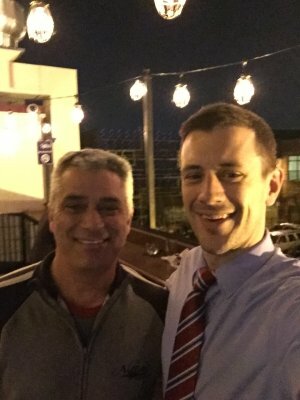 Although his only qualification would appear to be that he’s gay, Doug told me during a dinner interview that he’s always had an entrepreneurial spirit and a dream of how he could make such a bar a success. So in 2007, after a lot of hard work, he opened the doors of Nellie’s, named after his great-grandmother. It was an almost-instant hit and continues to thrive today. 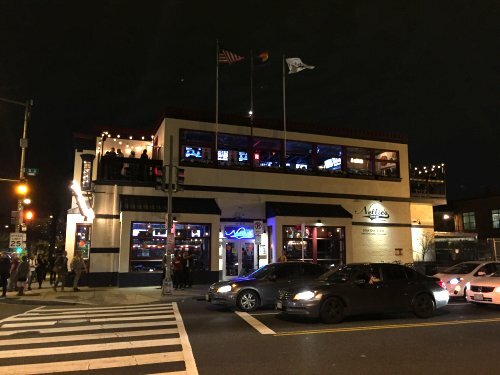 When Doug moved to DC in 1995, U Street wasn’t a promising area for a bar. As he describes it, some of the buildings nearby were mere shells, missing windows and, in some cases, roofs. 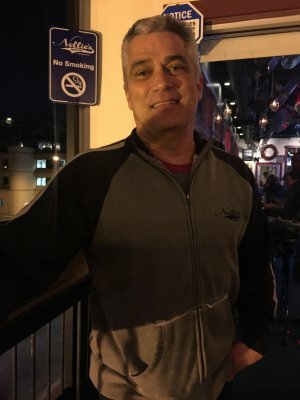 He recalls the late 90s and driving out of town via U Street — back than much less populated than you’ll find it these days — with his friends, accelerating until they hit the Maryland border. What inspired him to pick the location for Nellie’s? How does someone with zero experience in the industry set about launching a bar? And what was I going to have for dinner? Doug laughed again and then we raised our drinks to toast the interview. It was a mild Monday evening in mid-March, a few days before St. Patrick’s Day. Downstairs has a traditional rectangular bar running alongside the wall of one room, while another room has more than a dozen tables dotted around for dining and drinking, all packed with a mixed crowd that night. Yes, I got an O’Nellies t-shirt. No, I didn’t have a hangover the next day. Doug only had one drink at our meeting, so I doubt he woke up the worse for wear the next day. After we placed our food orders from the menu — which offers salads, burgers and more atypical fare like corn dogs and empanadas — he explained how his experiences living as an out gay man in Chicago and New York City laid the groundwork for Nellie’s. Doug’s career then brought him to DC in 1995. He was tired of working for other people and ready to quit advertising. He wanted to be his own boss, but doing what? During his time in Chicago and New York he had loved the bars in the gay neighborhoods where people could gather in a relaxed atmosphere. 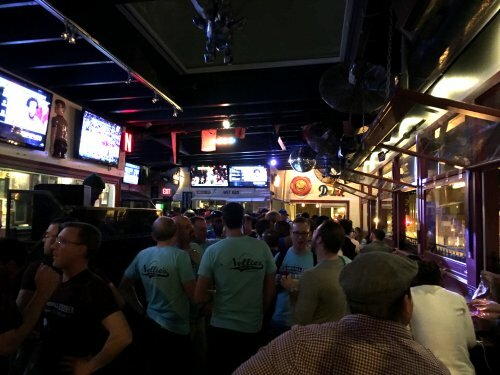 While he enjoyed visiting the gay bars in DC’s Dupont Circle neighborhood, he knew something was missing. Although he’s not a huge sports fan, he noticed a distinct lack of a gay sports back in the District. His ideal bar was going to be a locals’ sports bar that would be free from any attitude from the start. With his concept in mind, Doug then moved to the difficult task of turning it into a reality. He scouted locations and found the spot at 9th and U Streets NW. Nellie’s at that time was an Ethiopian restaurant, which was renting the building. Doug saw promise in the venue and in 2005 bought the business, which enabled him to adopt its hard-to-win liquor license. 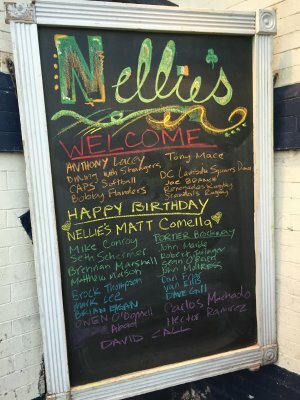 Then he renamed it Nellie’s in tribute to his beloved great-grandmother, and set about the process of refurbishing the place and re-branding it as the city’s first gay sports bar. “When I started I figured that would all take nine months. It took almost two years,” he said. But it all worked out, despite his lack of experience in the industry. 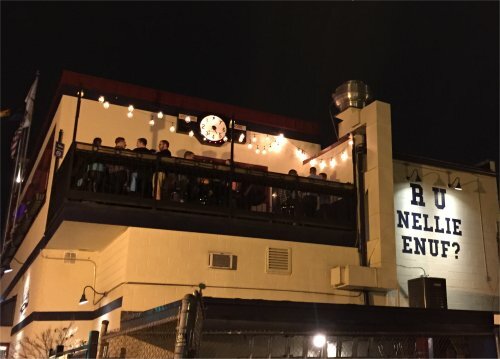 People are also praising the place, with Nellie’s routinely winning “best of” awards such as those that run in the Washington City Paper, Washingtonian magazine or gay publications like Metro Weekly or the Blade. 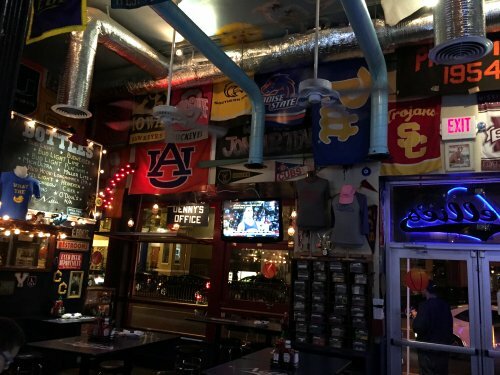 Doug’s grateful for both the free advertising and the popularity that his bar enjoys. And over the years he’s been running the place, he’s had some great experiences. Personal highlights for Doug include the night of the presidential election in November 2008, and what he described as an explosion of happiness when Barack Obama was declared the victor. “People were running out into the streets with their drinks, leaving their tabs behind,” he said, shaking his head and laughing at the memory. He still his strong memories of people lining the bar’s staircase watching all the televisions showing the results. “It was a great time,” he said. One of his more disappointing evenings — as reported in a recent interview that Doug did for Metro Weekly — was his idea of giving away a slice of free pie for anyone that ate at Nellie’s one Thanksgiving. “One night we literally gave away one slice of pie,” he said. “People just didn’t want them. Now, if I ever came up with a vodka pie…” he added, trailing off with a sly grin. There was no vodka pie on the menu for us that night, with Doug opting for a salad. 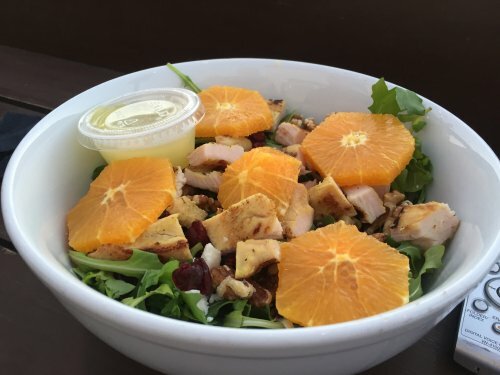 He played it healthy with the arugula salad of sliced oranges, feta cheese, dried cranberries, basil, walnuts, tossed with in a lemon vinaigrette with some slices of chicken. 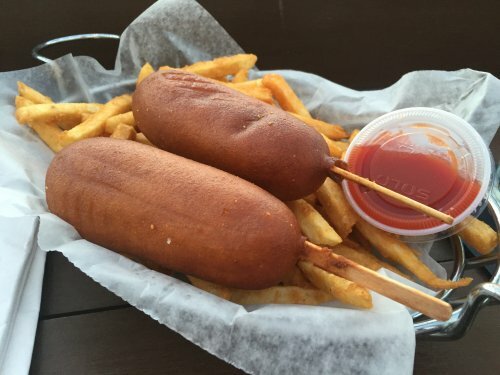 Spying corn dogs on the menu, the glutton in me couldn’t resist. “They’re very popular. That’s a heart attack express,” Doug said. Ignoring the threat to my heart and waistline, I went for them — and I’m glad I did. Perfectly cooked, the batter on the outside was crisp without being too hard, with a pleasant buttery taste. The hand-cut fries served with ketchup on the side were a fine accompaniment, and a great example of Nellie’s style of bar food. While we ate, Doug paused from talking about the bar to explaining how working the nightlife industry in DC is a far cry from his childhood and life in other cities. He grew up in Phoenix and as a kid would travel to Kansas to spend summers with his grandparents. 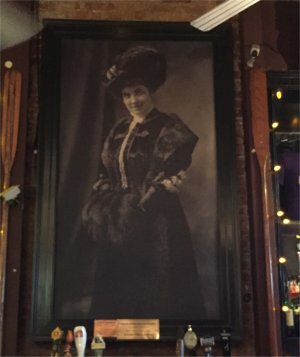 He never met his great-grandmother Nellie but heard plenty of stories about her, obviously enough for the woman to stay in his memory when he opened his bar. “We’ve always been a family that appreciates the past, I have a lot of family photos that have been handed down,” he said. His degree was in environmental design, taking old downtown areas and making them livable again. “This was before anyone realized what a bad idea it was to take old main streets and make them walkable. Now everyone is turning them back after figuring out they don’t really work as walking malls,” he said. Although he was self-depreciating about his college years, I noted that he’d taken a building in an older part of DC and turned it around. “I guess school was good for something,” he laughed in response. While at college — which had dozens of fraternities and sororities — he started his own business putting together “legacy” yearbooks for the frats. They were hugely popular and he tried expanding it to other universities in Illinois, Indiana, Missouri and elsewhere. But the idea failed to gain traction because the college kids he hired to help were hit-and-miss when it came to work. After university, Doug moved to Chicago and had his formative experience coming out. He also started work in advertising, which came about thanks to some successful planning. He had sent out 98 resumes to firms and got 98 rejections. “I still have them, I’ve been thinking about papering my toilet with them,” he joked. So he then went back to a couple of firms and put his resume inside one of the yearbooks he’d created, leaving it as an example of his innovative work. Firms would then call him and tell him to come collect the yearbook, given that it looked expensive. He worked in Chicago and New York on accounts such as Chase Manhattan Bank, Ace Hardware, BlueCross BlueShield, AT&T and more. “It was really boring work but they had lots of money, and I eventually I was just worn out by it,” Doug said. And so he moved to DC and a new life by launching a bar. Although Nellie’s crowd was initially largely gay, that’s morphed over the years into a wide mix of gays, straights, women and men. It has prompted some backlash from gay men in the city who mock the increasing presence of women in what they consider their own venue. 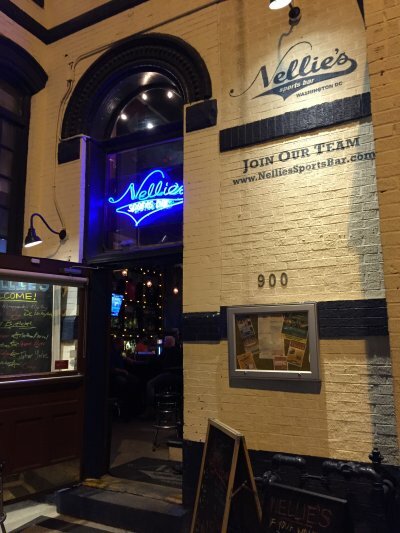 “When they write the history of Nellie’s, we’ll be blamed for letting all the girls into gay bars. We’re the epicenter, it went out to the entire nation from here,” Doug said, laughing. Then he turned serious to say that having a diverse crowd is exactly what his bar represents. As we neared the end of dinner — Doug left most of his salad, but I demolished the corn dogs and fries — I asked what his plans are for the future of Nellie’s, including its 10th anniversary next year. “I’ve achieved a lot here and I’m really happy with it,” he said, turning to look proudly over his bar. He gazed at the now-enclosed roof deck. “Maybe I’ll do a retractable roof this summer, but I have nothing huge planned. I feel like something here has always been under construction, so I’d just like to hang out for a while and enjoy owning this,” he said. He won’t rule out opening another bar in DC or another city, but that’s as much as I could get out of him on that topic. Understandable given the work he’s put in to Nellie’s, which he sees as a firm fixture in the city’s gay scene. Still, he doesn’t see the other gay bars (e.g. Cobalt, JRs, Trade, and others) as competition. “We all offer something unique,” he said. The uniqueness test for Nellie’s is emblazoned in massive painted letters on one exterior wall of the building, catching the attention of passersby on U Street. “R U NELLIE ENUF?” it asks. 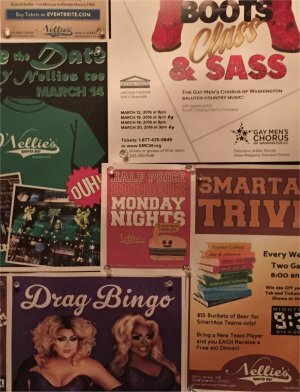 The question represents a sense of belonging at the bar, using the term “nellie” that was once a disparaging term for gay men, but also a tribute to Doug’s great-grandmother Nellie with family photos and other mementos visible throughout the bar. We said our goodbyes, and Doug left the bar before me. It had been another long day of running his dream, but he was in good spirits, proud of his success with the bar. When I left, I held the door open for some people walking in. A guy and two girls. Friends. All three had big smiles on their faces. They were probably Nellie enough.